Prime Minister Narendra Modi and his government have so far spent a amount of Rs 4,343.26 crore only for advertisements and publicity through different media. the amount was known through an RTI. Mumbai-based RTI activist Anil Galgali had sought details from the centre’s Bureau of Outreach and Communication (BOC) on all spend on advertisement and publicity in all media since the present government assumed office. The replies provided by Financial Advisor, BOC, Tapan Sutradhar on the expenses incurred since June 2014, were a revelation on the massive spends, but owing to all-round criticism of the government, there was a small reduction Rs 308 crore in 2017, said Galgali. 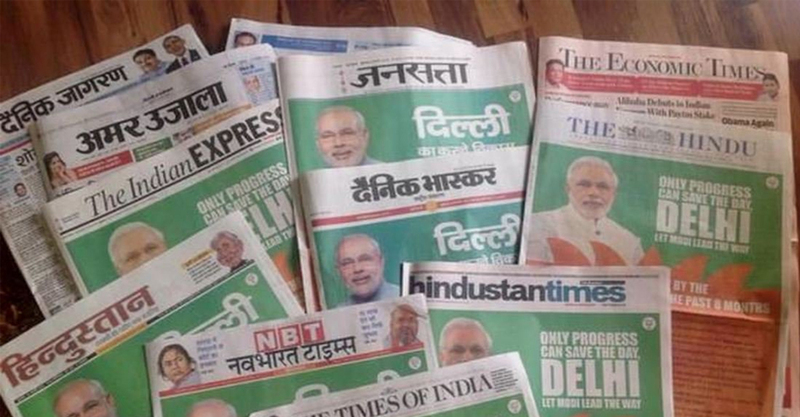 As per the replies, from June 2014 to March 2015, the government spent Rs 424.85 crore in print publicity, Rs 448.97 crore on electronic media and Rs 79.72 crore on outdoor publicity, totalling to Rs 953.54 crore. In the next financial year 2015-16, the spending increased substantially for all media. These included, Rs 510.69 crore on print media, Rs 541.99 crore on electronic media and Rs 118.43 crore on outdoor publicity, or a total of Rs 1,171.11 crore. In 2016-17, the expenditure incurred on print medium dropped (yet higher than the first year June 2014-March 2015), to Rs 463.38 crore, but for the electronic medium it increased over the previous year to Rs 613.78 crore, and catapulted to Rs 185.99 crore on outdoor publicity, totalling to Rs 1,263.15 crore. The next year, April 2017-March 2018, there was a sharp drop in spending on electronic media over the previous year to Rs 475.13 crore and a significant drop in outdoor publicity expenses to Rs 147.10 crore. The RTI replies also said that between April-December 2017 (nine-month period), the government spent Rs 333.23 crore on the print medium alone, with the total figure of last fiscal (April 2017-March 2018) coming to Rs 955.46 crore. “A detailed analysis proves that after stringent criticism it attracted, especially from the opposition and on social media, over squandering of scarce public resources, the government finally cut down on its publicity expenditure this year by Rs 307.69 crore,” Galgali told IANS. However, he pointed out that the total spending of last financial year is still significantly higher than the present government’s first year in office when it spent Rs 953.54 crore in just nine months in office. He added that although it is okay for the government to spend on publicity wherever genuinely required, in case of excess expenses, reins must be tightened and the authorities must publicise all such expenditure on its websites.